Some firms understand that an enthusiastic group of customers can extend their brand, if those customers are permitted to play with intellectual property. That's the case today with NBC/Universal, who had previously sought cease-and-desist orders against Battlestar Galactica roleplayers in Second Life. Now, according to the story in ArchVirtual, fans can again share BSP materials for non-commercial use. I wish the company had done so earlier. 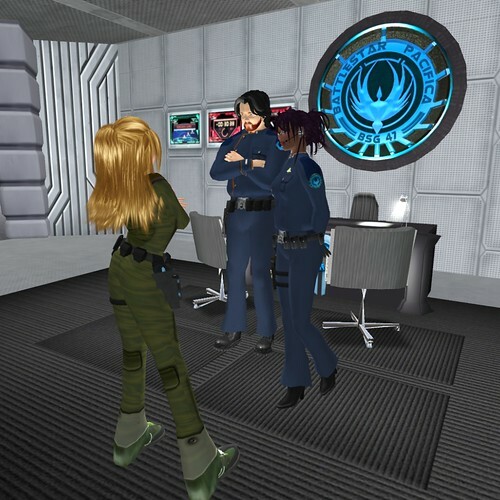 A few Galactica-themed sims have now closed. There's a long-standing precedent for letting fans just be fans and play: Paramount long permitted Star Trek fans to create derivative works. With the board game Star Fleet Battles, an old chestnut that is still around (I gamed it 30 years ago!) Paramount even granted permission for a commercial product based upon elements in the original Star Trek series. One could easily argue that these fans kept the ST franchise alive long after the cancellation of the original series. Now that BSG's run on TV has ended, for a time in any case, perhaps that franchise too will continue to thrive through the work of fans. I do hope that Frank Herbert's estate and others who have slapped around fan communities might actually talk to those fans, before crying havoc and letting slip the dogs of law.